Warrior Hearted Scholarship Recipient, Monica, is an adorable 10 year old non-verbal Down Syndrome child who is learning to use her new adaptive communication device to communicate with the world. 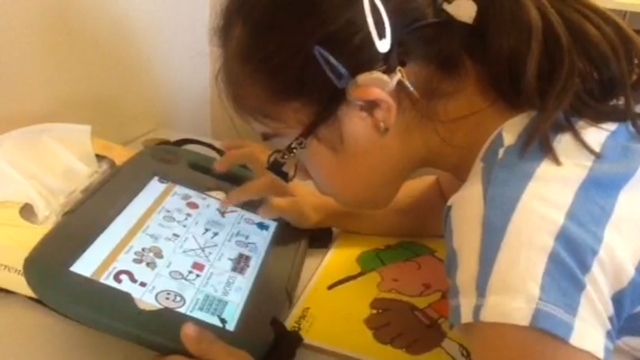 WATCH Monica learn to use her Adaptive Communication Device Warrior Hearted Scholarship Recipient, Monica, is an adorable 10 year old non-verbal Down Syndrome child who is learning to use her new adaptive communication device to communicate with the world. Make a one time donation to Warrior Hearted Special Children's Foundation and help us support the children. Donations are Tax Deductible. The Warrior Hearted Special Children’s Foundation is a 501 (c)(3) public charity, IRS Tax ID 46-4702050. 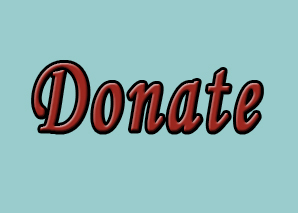 All donations are tax-deductible as allowed by law. Warrior Hearted will be funding through individuals and companies who are experts in their field who recognize the needs and are qualified to provide specific services. Joining Team Warrior Hearted is your opportunity to make a difference in the life of a special child. We welcome everyone to join. 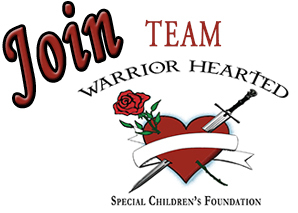 Team Warrior Hearted is the Warrior Hearted Special Children’s Foundation fundraising program.